At their most typical, dragons tend towards multi-limbed varieties; the most typical variation being four legs and pair of wings. Others tend towards a pair of wings with one or no pairs of legs (wyverns) or no legs or wings (worms). Whatever their configuration, two things are certain about dragons: (1) they are reptilian and (2) they are magical. So whatever lizard, snake, crocodile, or basilisk you encounter in the course of your day, be assured that unless you observe them doing magical things they are unlikely to be true dragons. For example, Drac’o Volans, the flying “dragon” of Southeast Asia, was mistakenly designated as a “dragon” despite its lack of magical properties… that we know of. (The flying dragon to the left, is however, the flying dragon of Wales, so chosen because William Morris was of Welch descent). So too the draconist must take care in handing out the designation “draco” as new varieties of flying reptiles are encountered. At any rate, many draconids with configurations other than as described above also exist. Moreover, it is important for draconian scholars to understand that the definition allows for non-flying varieties. Here I introduce some from an authoritative bestiary of dragon types with their accompanying legends. It’s important to note that unless a dragon bears its own myth and legend, it’s unlikely we have ever heard about them. While that is also true for many things, it’s also poignantly true for dragons. 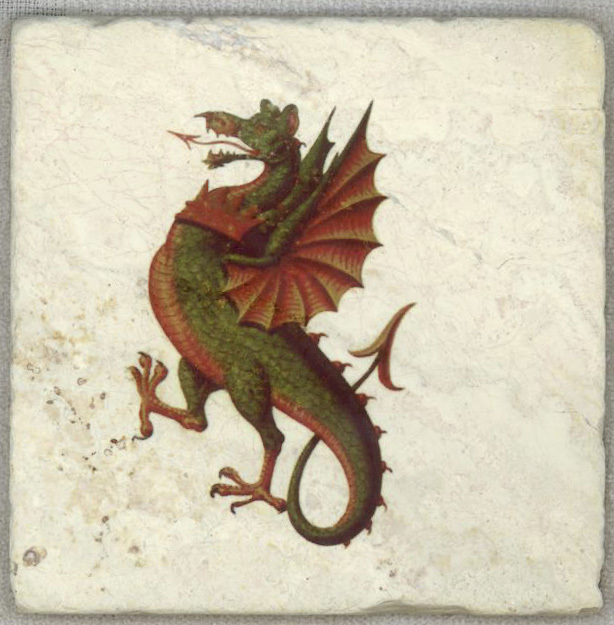 Two of the most famous dragons are described in Geoffrey de Monmouth’s history; and since this story includes the great magician Merlyn, the story is obviously true. When the warlord Vortigern usurped the throne of Roman Britannia, he promptly caused the building of a great tower. Despite having hired the greatest of Roman architects, no matter what structure was built it would be torn down by the next day. Having heard of a young magician who seemed to understand architecture (the reader will recall that Merlyn would later build Camelot), Vortigem consulted with the magician on how to solve this dilemma. The young Merlyn explained that all attempts to build a tower would fail as long as two dragons were fighting under the ground. As the builders dug deeper into the earth, to their amazement they discovered that Merlyn was right, a red dragon and a white dragon were fighting in a subterranean pool underneath the location. Now liberated from their watery tomb, the two dragon continue their fight until the red dragon defeated the white dragon. 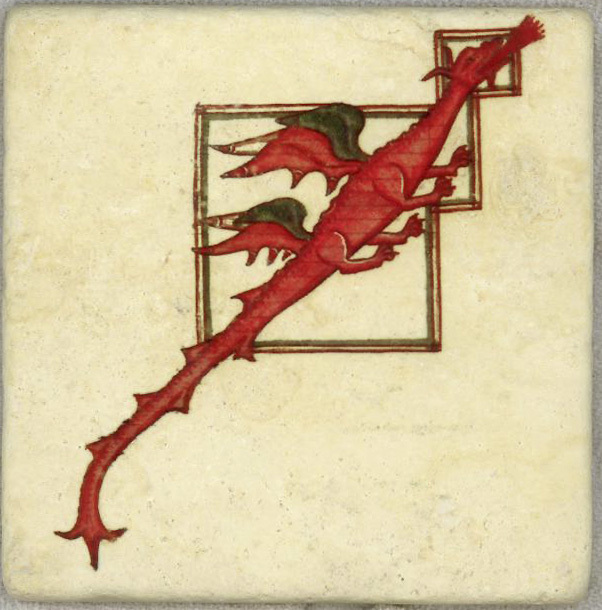 Merlyn explained that the red dragon represented forces that would overthrow Vortigern. As it turns out, Uther Pendragon, the legitimate heir to the Emperor Constans in Britain and Arthur’s father, raised a dragon banner and overthrew the tyrant. 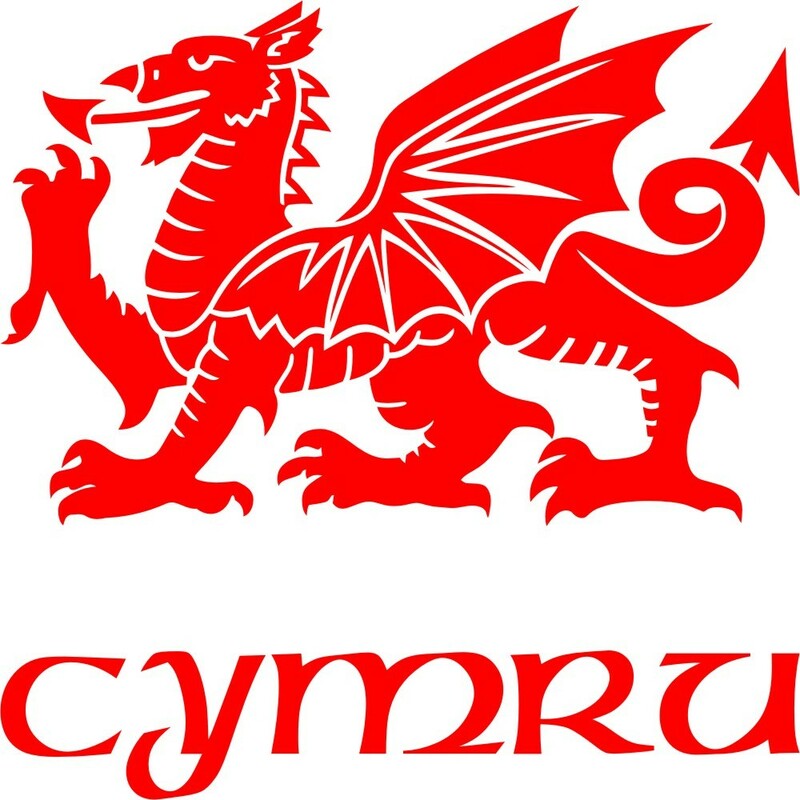 Ever since then the Red Dragon has been the standard of Wales and its most readily recognizable symbol, especially since it appears on the Welsh flag and on license places. The standard rendering of the Red Dragon of Wales. Cymru is what the Welsh call their country. Strangely enough, there are no more dragons in Wales. Here is the story about the last one. 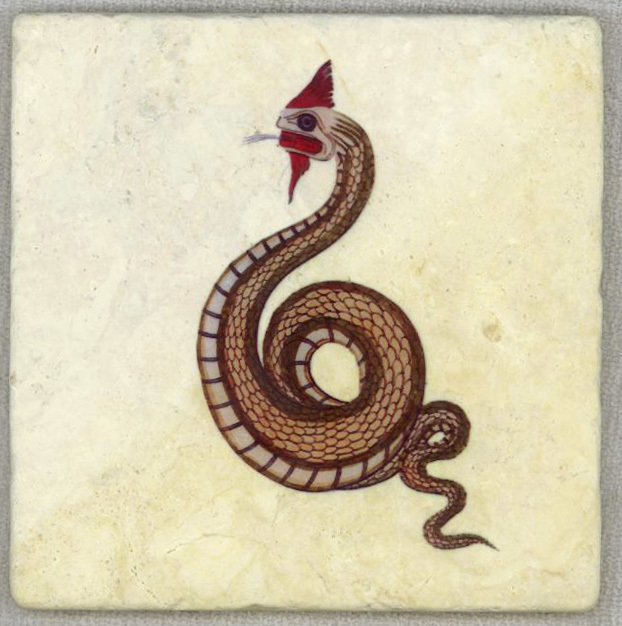 This is a story about a “worm,” as wingless, legless dragons are typically called. But let the reader be warned, as the Lambton family learned, that they are magical nevertheless. John Lambton was a rebellious fellow who skipped church one Sunday to go fishing. While enjoying this break from devotion, he fished out a small dragon no larger than his thumb (some say it was much bigger). An old man passing by saw this and told the recalcitrant John that he had caught the Devil. John believed him and threw the creature down a well. In order to make up for his rebelliousness, John then left for the Crusades, forgetting all about the dragon. As the years passed, the dragon grew larger and poisoned the well, because that is what worms magically do when left in water. The villagers noticed that livestock were missing and in the process of looking for the missing livestock, discovered the traks of the dragon all over a nearby hill. Alas, John’s family became destitute as the dragon ravaged the Lambton estate. Many years passed. John returned from the Crusades and was distraught to learn of the troubles at home. Upon consulting a witch, he learned that he was the one responsible for the Worm and therefore it must be he who would kill it. But the witch also warned him that because of the dragon’s magic, John must also kill the first living thing he encounters after killing the dragon or else the Lambton family would be forever cursed! So John told his family that upon killing the dragon, he would sound his horn three times, after which they must release a hound for John to kill and ward off the dragon’s curse. 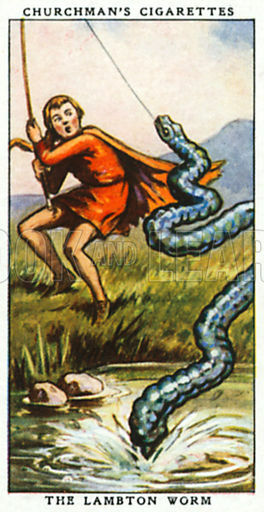 John fought the dragon near a river and cleverly chopped it into pieces so that it could not heal itself (this is also part of the worm’s magic) and in so doing, he vanquished the dragon. However, on sounding his horn three times, his family members were so happy that the dragon was vanquished that they forget to free the hound. Instead they all ran out to John to congratulate him on their newfound freedom. The first person John saw was his father, who of course John could not bear to kill. This is why all the Lambton’s seemed to die either tragically or in battle from then on. Although some scholars claim that Wyverns aren’t dragons, people who have experienced them know better. This was especially true for the people of Emlyn, a town in Wales. On a fine summer’s day, and for no apparent reason, a two legged dragon, that is to say a wyvern, landed the town’s tower breathing smoke and fire and making threatening glances at the townsfolk. After some minutes of this, the wyvern promptly went to sleep. This was, as you might imagine, very disturbing for the townspeople. The mayor called a meeting to decide what to do as the wyvern slept. One soldier devised a plan to lure the gwiber (which is Welsh for wyvern) off the tower in order to kill it. He floated a large red cloak down the river and asked the townsfolk to wake the wyvern up. Most of the townsfolk were not soldiers and their courage failed them. They refused to wake the wyvern. So the soldier climbed the tower and stabbed the gwiber in the belly and then ran away to safety! On waking, the gwiber saw the cloak floating down the river and rushed off to attack it and tore the cloak to shreds. Alas! the gwiber had been so wounded by the stab in the belly that she lost so much blood and then died. The gwiber turned over on its back and floated down the river, its venomous blood turn the river red, killing all the fish in the river. Despite the loss of the fish, the townspeople were overjoyed at the death of the dragon and celebrated. No one knows what became of the soldier who ran away after stabbing the dragon, but no dragon has ever been seen in Wales again. Another great resource for Dragon images.